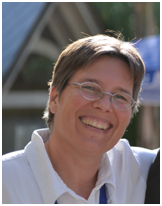 Bio: Susanne focuses especially on adaptation in coastal areas, transformation, decision support, and effective climate change communication in support of social change. She is co-editor of the books Successful Adaptation (2013) and Creating a Climate for Change: Communicating Climate Change and Facilitating Social Change (2007). She has also contributed to the IPCC, National, and California Climate Assessments, among others. Before moving to Hadley, MA, Susanne worked for 10 years in CA and was a Fellow at Stanford’s Woods Institute for the Environment. Climate change adaptation project she's currently excited about: “The Adaptive Mind” Project aims to understand how to deal with the constant, sometimes traumatic and increasingly transformative change resulting from climate change. Her team will be developing trainings and support networks centered around personal resilience and the ability of humans to respond to constant change. These efforts will support professionals in all fields working to respond to and reduce the risks and suffering from climate change, especially those in coastal, urban and frontline communities. Action Grants - $10 million of funding for action grants are available through the Municipal Vulnerability Preparedness (MVP) program. Funding will go to designated MVP communities to assist with integrating adaptation actions identified through the MVP or similar designated process. Projects that propose nature-based solutions or strategies that rely on green infrastructure or conservation and enhancement of natural systems are preferred. Find all the application materials here, due by Apr. 19. The RFR also includes a helpful list of other State grant programs that can support implementation of adaptation actions. Planning Grants - See here for the RFR for the MVP FY19 Planning Grants. Applications accepted by communities on a rolling basis until May 3rd or until all funds have been awarded. Anticipated funding amounts of $15,000 - $100,000 per municipality award. Information sessions - Join EEA staff and local legislators to learn about MVP Grants. Contact meg.colclough@mass.gov to RSVP. Funding Opportunity - The Wildlife Conservation Society is awarding grants through the Climate Adaptation Fund to implement science-driven, on-the-ground actions that assist wildlife and ecosystems to adapt to climate change at a landscape scale. Pre-proposals are being accepted until Apr. 5 here. Award Opportunity - Nominations for the 2019 Climate Adaptation Leadership Awards for Natural Resources are now open. This award honors those who aim bolster resiliency of our country's natural resources. Nominate here until May 18. Conference - Watershed Action Alliance Conference: The Future of Water in New England, Mar. 29. Featuring a session on "The Future of Water in New England"
Restoring Connecticut River Flow in a Changing Climate, with Kim Lutz of The Nature Conservancy. Mar. 27, 12 pm, join here. Climate Adaptation Science for Coastal Habitats, Species, and Ecosystems, with NE CASC Science Coordinator, Michelle Staudinger. Apr. 3rd, 12 pm, join here. The National Adaptation Forum is Apr. 23-25 in Madison, WI. The Program Committee saw tremendous interest this year indicating how much our field is growing across the country. Are you attending? Let me know! Hope to see you there! You may have noticed that we sometimes include a photo of Massachusetts' natural beauty in the newsletter header. If you have photos you would like to submit to share (we'll attribute to you in the footer), please send them to massecan@umass.edu. Welcome to a new community of practice for climate adaptation practitioners and researchers who are interested in ecosystem resilience and natural resources conservation in Massachusetts.